Most television audiences may not realize just how a government shutdown can leave a documentary filmmaker stranded in a Southern California desert. 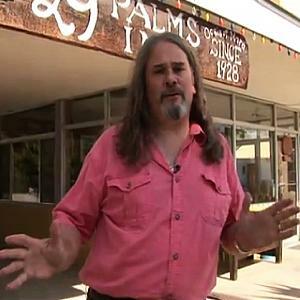 Joshua Tree resident Steve Brown, who is host, writer and co-producer of The Real Desert with Steve Brown, told the Civic Bee how the recent government shutdown, which began on Oct. 1, directly interfered with his newly launched production, a PBS TV documentary series airing on KVCR PBS. Documenting some of America’s oldest and riches cultures of the Southwest, The Real Desert series covers the desert regions of California, Arizona, Nevada, New Mexico, Utah, Colorado, Texas, and portions of eastern Oregon, as well as Mexico, including Baja California. Brown said his production was impacted by the government shutdown when they had to cancel a scheduled shoot on the Naval Air Weapons Station China Lake, near Ridgecrest in the northern Mojave Desert. However, members of the production received an e-mail from the base liaison who handles filming, canceling the shoot due to the government shutdown. And though base officials have gone back to work, The Real Desert crew has not been able to reschedule the shoot, according to Brown. “What this means is that an episode of The Real Desert that could have been airing by now and helping to promote the Ridgecrest area as a tourism destination for the residents of Southern California, isn’t shot yet, and because of the advancing winter (the petroglyphs are up at the 5,000 foot level), may not be shot until early spring of 2014,” Brown said. Brown, who helps promote desert tourism, said the shutdown caused a lot of damage to the local tourism industry. According to Brown, when travel and tourism is disrupted on a large scale because Congress has shut down the government for several weeks, other destinations have the advantage of marketing themselves as being unaffected by government closure. “Businesses here in Joshua Tree were laying off staff and experiencing business levels half of what they normally see that time of year,” he said, noting that the tourist season for that region began on the day the government shut down. “And if Congress pulls the plug again in January, we’ll see a large scale loss in international tourism oriented around our national parks,” Brown said. According to Media Matters for America, mediamatters.org/blog/2013/11/07, a widely-reported impact estimate from financial ratings agency Standard & Poor’s put the cost of the government shutdown at roughly $24 billion. For more information on the show visit realdesert.com or facebook.com/RealDesert.